Getting down to your subject's eye level, whether it's a squirrel or a bird, can create a really intimate and natural portrait. But just laying down and relying on your elbows as a camera support isn't very comfy, or solid enough to reduce camera shake and ensure proper, sharp pictures. So, if you need to go really low to get the best shots, the simple remedy is to rest your lens on a beanbag. Some posh beanbags can cost over a tenner, but save it for the pub! In the latest installment in our DIY Photography Hacks series we'll show you how to reduce camera shake by making a great SLR support for the price of a bag of lentils and a dodgy old pair of old jeans! First, get an unwanted pair of jeans with a sturdy zip. Then mark a line across the mid-waist and legs. You want to create a 'V'-shaped groove for maximum stability. Cut the jeans to size, leaving a decent-sized hem. Ensure the zip is undone as you do this. 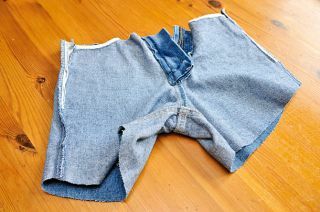 Turn the jeans inside out before you start stitching. A sewing machine makes short work of the seams and around the zip area. Turn the beanbag the right way out by passing the material back through the zipper hole. 4. Bean there, done that! I prefer to use ordinary lentils as a filling because they feel fluid yet supportive inside the beanbag. Poke a funnel through the zip, fill it up and close the zipper to seal. Field-test time! Rest your lens in the beanbag's 'V' shape for instant stability. You can also hang that same 'V' shape over a car door for a stable shooting platform. You'll be able to see the results instantly, because such a stable and comfy platform means you can stay in position longer - and eliminate elbow-induced camera shake.